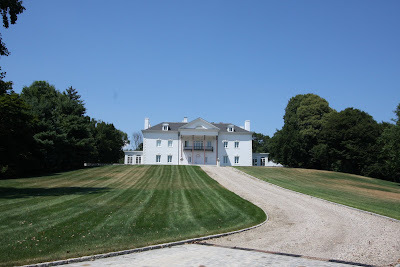 'Rosemary Hall' was built for Foxhall P. Keene by Freeman & Hasselman c. 1902 in Old Westbury. The rear originally had a series of terraces that led to a formal garden. The house caught fire some years ago and sat in disrepair as the front of the property was subdivided, but someone has clearly undertaken an extensive renovation, given that the four front columns are missing at the moment. Click HERE to see 'Rosemary Hall' on google earth. I've lived at that house from 2004-2010. Those years were the best years of my life. The sad part is that i could barely experience its beauty since i was so young. I faintly remember all the good memories i had during my life there. I felt on top of the world, since the house was situated upon a hill. Every room felt exquisite in it's luxury. But since i moved 6 years ago all my knowledge about life there is told by my older brothers or parents. It was a somber day when i moved, and that day was the day my life changed. I was faced with the reality that life won't get better as you age. I moved from smaller house to smaller house, and all my memories of the good times have been buried in negative thoughts about the future. As a person who has experienced this shift, I would advise anyone to think twice before moving in to a mansion. You will never experience true happiness in this lifetime.